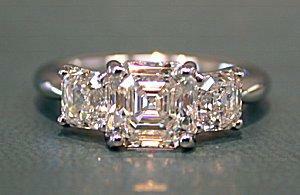 Royal Asscher cut engagement ring designed by Diamond Brokers of Florida. The central diamond of an engagement ring is the focal point for the jewelry, and choosing the perfect diamond shape is the key to a ring that not only expresses love and beauty, but also symbolizes the treasured relationship a couple shares. LoveToKnow Engagement Rings spoke with Janice Roshto, president of Diamond Brokers of Florida and certified GIA certified gemologist, about her insights into choosing the best diamond shape for an engagement ring as well as how to work with unusual shapes. There are many different diamond shapes to choose from, and knowing the intricacies of the market helps couples choose the best shape to suit their budget, personality, and relationship. LoveToKnow (LTK): What diamond shapes do you specialize in? Janice Roshto (JR): We specialize in ideal cut hearts and arrows, round brilliant diamonds, princess cut diamonds, Royal Asscher and Asscher cut diamonds, cushion cut diamonds and basically any shape that is out there as long as it is well cut. We also sell colored diamonds as well as fine colored gemstones. LTK: Which shapes have become more popular recently? JR: For us it is the Royal Asscher cut diamonds which is a patented cut, cut by the Asscher family in Amsterdam. It has been gaining in popularity but is of very scarce supply. LTK: What accent stones and arrangements are most popular? JR: Lately the vintage look has been the most popular, like hand engraving and diamond pave styles. LTK: Which shape is the most difficult to cut and mount in an engagement ring? JR: I would say from a setting standpoint, the most difficult to set is a princess cut diamond. Special care has to be taken in setting the princess cut because of the sharp corners of the diamond shape. LTK: What factors should a couple consider when choosing a mounting? JR: On mountings, I would say to try them on your hand to see what appeals to you best. You can like pictures of them, but when you try them on you may not like the way they look on you. Also they may want to take budget into consideration. Some clients love lots of diamonds on the side and platinum, and others prefer a plainer solitaire style. The past few years the vintage look has been very popular. LTK: How does a diamond's shape affect its quality or value? JR: The most expensive cut is the Royal Asscher because it is a patented cut diamond with a limited supply. The round brilliant would be next, and then the other shapes follow from there. It is based on supply and demand. LTK: Are there special precautions a couple should take when caring for an unusual diamond shape? JR: Any diamond can get damaged if not properly cared for. They are really for adornment and should not be worn while doing things like strenuous exercise and gardening and cleaning. I usually tell my clients to think of your jewelry like a good dress. If you were to wear it all the time and drag it around the garden, it's not going to look very nice either. LTK: How do you design a mounting for an unsual shape? JR: We have thousands of mountings available for any shape diamond. It is basically what the client wants. They give me a picture of what they like and then we offer them options in that style. LTK: How long can it take to create a mounting for a usual shape? JR: It can take 4- 6 weeks. Janice's passion for the industry is evident. She shares in her own words the best part of working in this business: "When I was a little girl, my father was a minister and I grew up going to weddings and watching people getting married. Today, I still have a part in that romantic excitement when we find the perfect diamond for our clients. We have even had some of them propose marriage in our store. It still gives me a warm feeling to know that I had a part in that happiness." Diamond Brokers of Florida was founded by Janice and Brad Roshto in 1985. Located in Melbourne, Florida, the company manufactures diamond settings and custom rings based on Janice and Brad's more than 45 years of combined experience in the jewelry industry. They offer not only exquisite designs, but also provide customers with a Learning Center to become educated diamond connoisseurs in order to make the best possible purchase. For more information about Janice and Diamond Brokers of Florida, visit the website at: www.dbof.com.